circumscribed depigmentation of the hair, particularly of the scalp, occurring in association with or following various pathologic conditions. See also leukotrichia and canities. 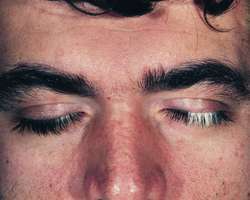 A patchy absence or lessening of melanin in hair of the scalp, brows, or lashes, due to lack of pigment in the epidermis; it occurs in several hereditary syndromes but may be caused by inflammation, irradiation, or infection such as herpes zoster. /po·li·o·sis/ (pōl-e-o´sis) circumscribed loss of pigment of the hair, especially following some pathological process. depigmentation of the hair on the scalp, eyebrows, eyelashes, mustache, beard, or body. The condition may be inherited and generalized or acquired and localized in patches. Acquired localized poliosis often occurs in alopecia areata. A condition in which there is a lack of pigment in the hair, eyebrows and eyelashes, which appear whitish, grey. The condition normally occurs in patches. It is often associated with vitiligo, alopecia and forms part of the Vogt-Koyanagi-Harada syndrome. localized loss of pigment in the hair.